The Austrian offensive began to weaken, for the Russian successes had compelled the transfer of Austrian troops from the Italian front to the Galician theater of war. This withdrawal enabled the Italians on June 9, 1916 to launch a counter offensive. Artillery duels were maintained along the whole front, and the invaders were pushed back in the upper Arsa Valley and along the western slopes of the Monte Cengio. On June 10, 1916, an Austrian attack at Monte Lemerle was repulsed with heavy losses. The Italian offensive was livening from the Adige to the Brenta. On the next day Austrian airplanes dropped bombs on the military hospital at Vicenza, and also attacked Venice, Thiere and Mestre with slight damage. The Italians, on June 12, 1916, carried the strongly fortified line from Parmesan to Tio Romini. The Austrians, by violent artillery action, attempted to regain the initiative, but were everywhere thwarted with huge losses. Their offensive had utterly failed. Relieved of the enemy's pressure, the Italians again took up the offensive and with renewed energy made for Trieste and Trento. But the Austrians were even still better prepared than before to obstruct their advance. Here Italian engineering genius triumphed. Gigantic and endless trenches, caves and forts had been excavated. In addition, a tunnel 850 feet long, and reaching to within 90 feet of the Austrian trenches, had been bored, in which 800 Italian troops were assembled. At a given signal, the men leaped from these secret pockets and assaulted the Austrian positions with incredible rapidity. Within 20 minutes three lines of Austrian trenches were carried ; the redoubt on the summit fell within an hour, and the chase went on along the crest and down the sides, straight to the banks of the Isonzo, the Italians taking many prisoners. San Mauro was taken by 6 o'clock, after which the work of intrenchment was begun. 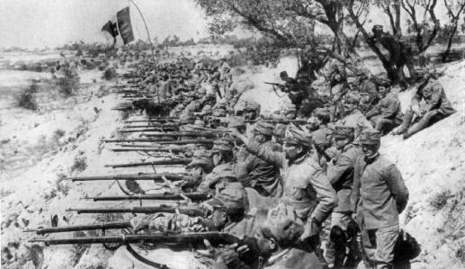 The Austrians, on the following day, were compelled to withdraw to the eastern bank of the Isonzo ; at the same time the positions on Monte San Michèle were evacuated, and the Italians thereby were put in full possession of the Gorizia bridgehead. In three days they had taken 10,000 prisoners, 20 cannons, 100 machine guns, and had recovered the territory they had lost in the spring. Gorizia was now subjected to a devastating artillery fire, under cover of which the Italians crossed the Isonzo at nightfall of August 8, 1916. On the next day the bridge over the Isonzo was taken by storm, after a most sanguinary battle, and the Italians at once occupied the city. The pursuit of the Austrians continued, and by September 11, 1916, the Italians had advanced five miles nearer to Trieste. By this time the Austrians had been reinforced and they seemed to be determined to stop the Italian advance across the Carso Plateau. An attack on the Carso Plateau, on the evening of September 14, 1916, carried the Italian lines forward a few miles. The height of San Grado was taken by storm. During the next two weeks only minor engagements were fought along the whole Alpine front, except at Mount Cimone. Early in the morning of September 23, 1916 the entire summit was blown up by an Austrian mine and the occupying Italian force of 500 men destroyed. In October, a notable though terribly exhausting advance was made along the Carso Plateau, that strongly fortified bulwark of Trieste. Without giving the enemy a moment's respite, numerous diversive actions were undertaken in the direction of Trentino, among which for the heroic efforts made and the important tactical results obtained, special merit must be awarded to the retaking of the Pasubic district and the march in the zone of the Alps of Fassa, where the mountainous peak of the Cauriol was conquered and the Austrians were compelled to concentrate a number of their forces on this point, diverting them in this way from other fronts. With the beginning of November 1, 1916, the Italians once more resumed their drive again against Trieste, and in four days of fighting on high mountain peaks advanced their lines, taking 10,000 prisoners. But their own losses also were heavy, compelling a cessation of hostilities. Excepting for a series of artillery duels during November, neither side undertook any important engagement. The early and hard winter surprised the combatants on the new lines and delayed, without suspending, the operations on the mountains. The great works carried out by the Italians during the summer and autumn to facilitate the carriage of the gigantic pieces of artillery up the steep slopes of the highest peaks of the Alps, to victual and furnish new supplies to the soldiers nestled up in the heights, constituted one of the most difficult engineering feats ever known. On no other front were there so many natural obstacles to overcome, with so many dangers to face; such as avalanches, aerial raids, frozen limbs, bombardments, mines that would unexpectedly blow up, etc. On no other front was there greater difficulty in the matter of supply and transport and the care of the wounded. Every stretcher bearer found himself continually exposed to the peril of falling over a precipice together with his wounded. Over all these obstacles the Italians triumphed. They drove the Austrians back, foot by foot, up the almost vertical Dolomite rock, sometimes by the fire of their mountain, field and heavy guns, but oftener in hand to hand and bomb fighting. Sniping never ceased by day, but the actual battles were almost invariably fought at night. The only day fighting occurred when, failing to carry it by direct assault, the whole or part of a mountain top was blown off. Tunnels were driven by machinery through the solid rock beneath the Austrian strongholds, which presently disappeared under the smashing influence of 40 tons of dynamite. Then the Alpini would swarm over the debris and capture or kill the enemy. Food for the men and ammunition for the guns were first carried up zigzag roads, especially built by the Italians for this War. When these roads had reached their utmost possible height, the guns were carried up a series of wireways, steel cables slung from hill to hill, from ridge to ridge, spanning the yawning depths and reaching almost vertically into the clouds. Up these cables the guns and food were handed, as well as timber for the huts in which the soldiers lived, and material for the intrenchments. And down these dizzy wireways, the wounded were lowered. Add to these difficulties the assaults of Nature; the gales and snowstorms were excelled in horror by the avalanche. On one day the melting snow revealed the frozen bodies, looking horribly lifelike, of a whole platoon which had been swept away a year before.